I didn't share the whole story about my garlic and shallot harvest this year; maybe it was too depressing, or maybe because I didn't have answers, I thought it wasn't worth talking about. I know I wrote about the fact that the garlic harvest was meager; and I said that, while the shallot harvest was large, about half were strangely soft instead of firm, and I wasn't pleased with the quality. But I kept what I could and hung them up in the house as usual after curing them, hoping to get a little further in the year before having to buy shallots and garlic at the store. We use a LOT of these two vegetables, and it kills me to have to buy them. I really rely on our yearly crop. The garlic harvest was even worse than the shallots. Most of the bulbs had not grown properly - some were just one inflated clove - some were small and ill-formed. Only a few were of the proper size and shape. The leafy parts were limp and small. I couldn't figure out what I had done wrong. All I could do was blame it on the weather - we had mild weather with no rain until March, and then suddenly a deluge of rain all at once. It was a very strange winter. In May, I seeded those beds - the ones that had held both garlic and shallots - to summer cucurbits; cucumbers (which have done excellently) and melons (which were extremely slow to get started, and are just now putting on fruit). Of course I amended both beds with compost before planting. Anyway, about a month or so after I hung up all the garlic and shallots in the house, I went to cut a bulb off of a shallot and was surprised by the fact that all the foliage on the tops was black. And I mean, so black. I looked more closely and found that the leafy parts of all the shallots were covered with black aphids. Not just a few - a solid mass of critters. I had seen these on the growing garlic and shallots, but thought that they moved on to greener pastures during the drying process on top of the chicken coop. Guess they were just hiding. I was completely skeeved out by the whole thing and threw out all the shallots. (Compost, not trash.) Then I went to inspect the garlic. You guessed it - also covered in black aphids. I was MAD. I've never had problems with my harvests before. Always big, beautiful bulbs of shallots and garlic. Enough to last us for most of the year. Enough to give away some. I have people that BEG me for a braid of garlic. (No one ever begs for pickles.) I had to resign myself that I had a crop failure and I might never know why. Aphids were not the problem. Something else was the problem; the plants were weak, and the aphids saw an opening and took it. But what that problem was, I couldn't figure out. WELL. 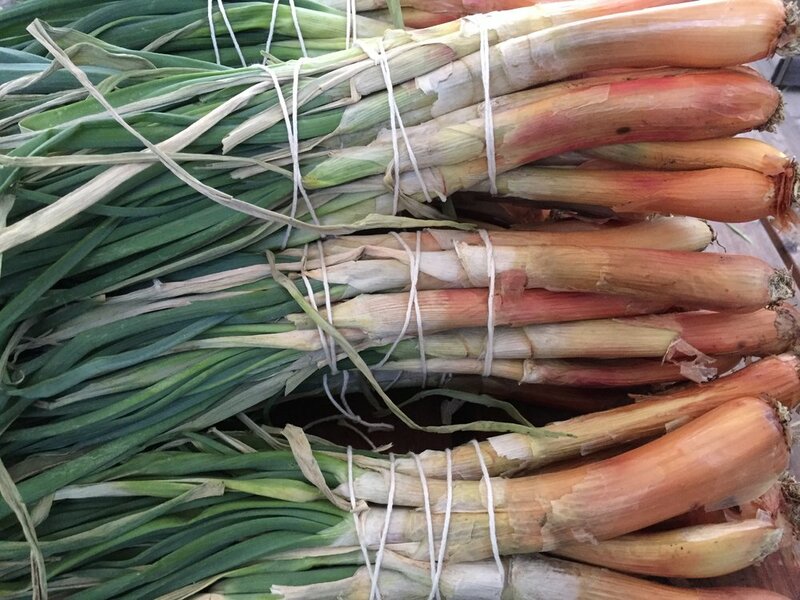 Earlier this week I got an email from Pleasant Valley Farm Supply, the place from which I ordered my seed garlic and shallots this year, and also where I got them last year. Pleasant Valley doesn't actually grow these themselves, they get them from local growers. And this year (the email said), there was a catastrophic crop fail of shallots. Not all of them, just the organic shallots. Would I accept conventional seed instead? I didn't think much about it, and wrote back to the company that yes, I would accept that. (Not much choice, most other seed houses are already sold out of this year's garlic and shallots.) We had noticed that organic shallots were hard to find lately in Whole Foods. I was having to buy conventional at the local supermarket. But I did not connect the dots on that until I got another email today from Peaceful Valley. Guess what this one said? "We are very sorry to say that we will not be getting most of our organic garlic varieties in stock this season. Our grower just informed us that they all either tested positive for bad nematodes or come from the same place as a variety that tested positive for bad nematodes. We know this is a huge issue, but we cannot prepare for this type of crop failure in the future, as we can not know how they will test for nematodes until the varieties are grown and sent to the lab for testing." A HA! Organic garlic crop failure as well! Holy cow. This brought me to the UCANR website (University of CA Agricultural and Natural Resources, my source for all things farming in CA) where I found an article about nematodes on onion and garlic crops. And this sentence especially made me sit up straighter: "They (allium nematodes) are capable of surviving drought for many years in or on dry plant material, only to become active again with rehydration." !!!!! It kinda WAS the weather! Dry conditions until March, and then the rains began in earnest. It's like those nematodes just sat there waiting and then BAM. There are three kinds of nematodes that feed on allium crops, and I'm not sure which one I had. Maybe all three. I very likely got the nematodes from the seed garlic and shallots, which I can't really bring myself to be mad about, because those poor farmers. They had it too and didn't know it until they had catastrophic failure this year and lost all their income from that crop. My little problem was measly in comparison. Or maybe they were already in the soil, just waiting to pounce? Who knows??? So now I'm in a little quandary. I can't order seed from elsewhere, because it's likely to be sold out by now, or they get their starts from the same places as Peaceful Valley. I will be using conventional seed garlic and shallots, because that's all that's available, so maybe it will have some natural resistance. I certainly am not going to plant it in the same place as last year; I'd already set aside another spot for it. And I was going to plant double the amount in case of another failure. The only thing UC recommends is crop rotation, which I already do. I won't be able to plant any alliums in those beds for three years, which isn't a problem. So I guess I'll go ahead and try again. Oh well. Live and learn. Try and try again. Choose your pithy saying. Compost, compost, compost. That's one I'll take to heart. I'll be adding lots of organic matter to the beds before planting any winter crop seeds. That usually helps to correct any problem. Maybe I'll send a soil sample in to Earthfort in Oregon, to see what kind of nematodes I've got in there. Meanwhile, I do feel better knowing that it wasn't something I did wrong in the growing season; just a freak thing that could happen to anyone (and actually did happen to others, lots of others). It'll be interesting to see what happens this coming growing season.